Goodbye, cakey or chewy lemon squares. 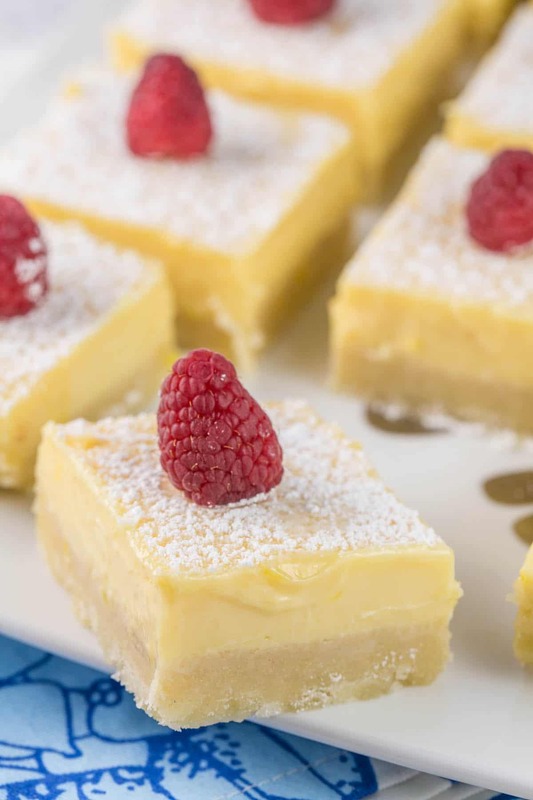 These lemon pie bars are made with a creamy custard, jam packed with lemon flavor, on a crisp lemon shortbread crust. The perfect combination of sweet-tart and creamy-crispy. 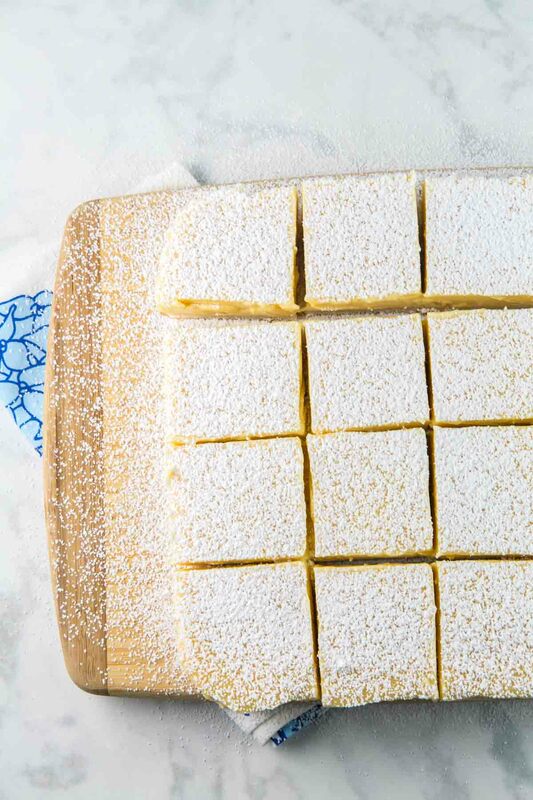 These aren’t your standard lemon squares. Lemon square are usually pretty flat. There’s a thin shortbread-ish crust, topped with a thin layer of flour-based lemon filling. The flour (or sometimes cornstarch) helps to set the bars, but it also bakes into an often gummy-ish consistency. Don’t get me wrong: I love a good lemon dessert. Lemon is quite possibly my favorite dessert flavor, and I will never turn down a lemon square. 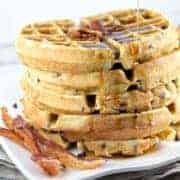 But after finding a jar of lemon curd in the back of the refrigerator and spreading it on pancakes and waffles and everything in sight for a week or two, I wanted something better. 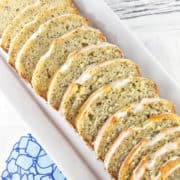 Something richer and smoother and softer, with more lemon flavor and more creaminess. I wanted lemon curd, except thick enough to slice in a bar farm. Then I realized what I really wanted was the creamy lemon pie I made earlier in this year. Usually I make desserts, I enjoy a slice, and I pass the rest on to neighbors. Except… I’ve kind of been thinking about that lemon pie nonstop since I made it in March. I wanted more of that lemon pie, and I wanted it in a hand-held bar form. So that’s exactly what I made — lemon pie bars, instead of classic lemon squares. 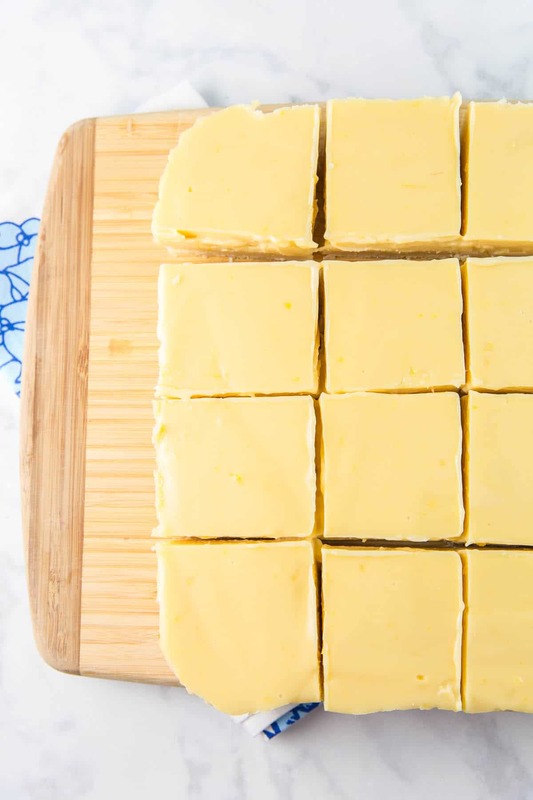 The egg yolk helps to ‘set’ the condensed milk and lemon juice as it cooks, resulting in a firm enough texture that you can slice the lemon pie bars. The lemon pie filling stays soft and silky smooth, but is just stiff enough to give you a nice clean cut when you slice into the bars. No oozing filling, but also no cake-like texture from too much baked flour. It’s as close to eating straight lemon curd as you can get in bar form! Instead of the graham cracker crust for the pie, I went with a shortbread crust with a little lemon zest. As much as I loved the original graham cracker crust, it can be a little crumbly for a handheld food. Plus, we want something that can last for a few days before getting too mushy. One of the reasons I really like a shortbread crust is because it doesn’t puff up too much as a base layer. By skipping the classic creaming-together-butter-and-sugar step, we’re not adding additional air and lift into the dough. Instead, everything gets quickly mixed together in the food processor (or cut the butter in by hand), making these super simple. I also like shortbread crusts because they’re not too sweet — a nice contrast to the rich lemon pie filling. Unlike the actual lemon pie, lemon pie bars are best topped with a thorough dusting of confectioners sugar. I mean, is it really a lemon bar without that beautiful coating? Just wait until immediately before serving; the sugar will melt into the bars within a half hour or so! I love the look of perfectly crisp lines outlined with a coating of powdered sugar, but if it’s not your thing, go with a dollop of whipped cream. Or some berries and sprig of mint. Or naked – just let the delicious sweet-tart lemony goodness shine. 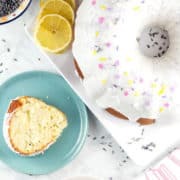 Love lemon desserts? 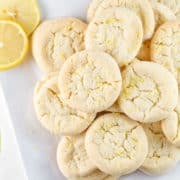 Don’t miss these lemon recipes! 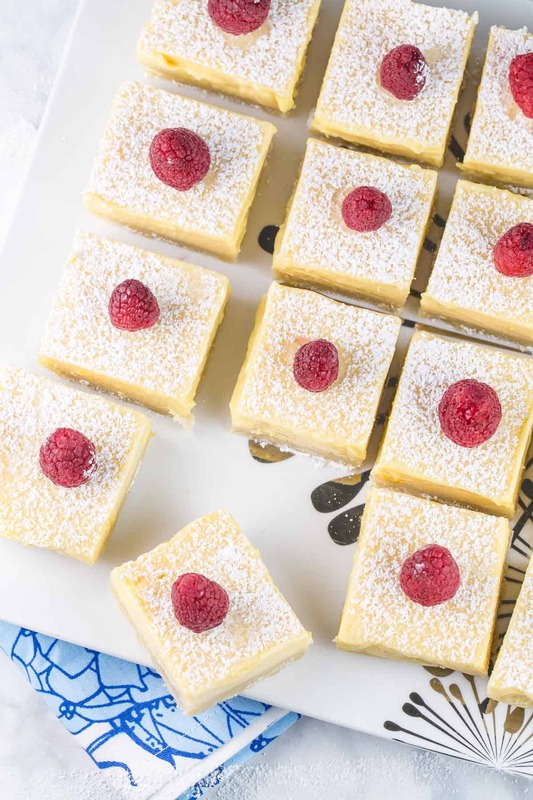 These lemon pie bars are made with a creamy custard, jam packed with lemon flavor, on a crisp lemon shortbread crust. Preheat oven to 350 °F. 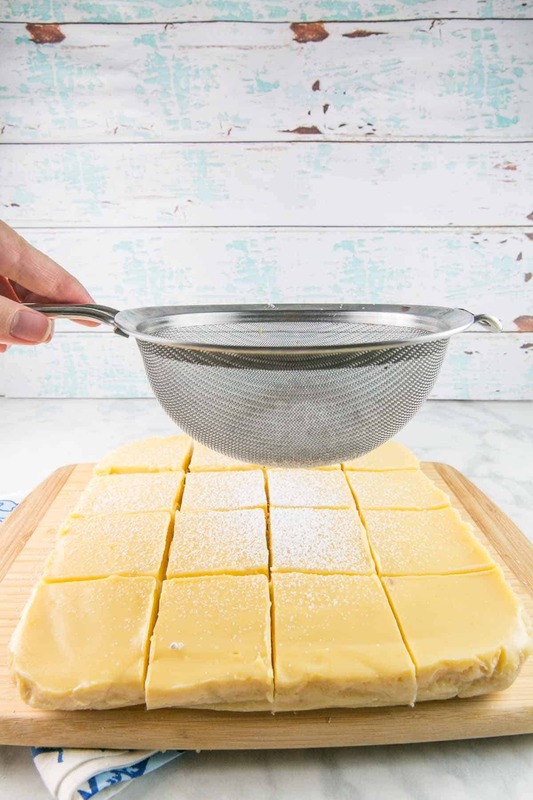 Line a 9×9-inch square pan with aluminum foil, then lightly grease. Return the baking pan into the oven and bake until the filling is set, 20-25 minutes. Cool completely at room temperature, then transfer to the refrigerator for 1-2 hours, or overnight, until bars are set. Cut bars into squares and top with additional confectioners sugar immediately before serving. These look just perfect! How did you get them so creamy?! YUM!D I love the raspberries on top because lemon and raspberries go sooo well together. I have really been wanting to bake something summery lately, but my fiance’s brother hates all types of fruit. 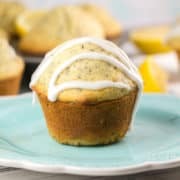 But he loves lemon desserts, so I would love to make this for everyone. Maybe without the raspberries just for him! Oh. My. GOODNESS. The custard here is pure genius!! This looks like suuuuch a dreamy, decadent dessert and I want to dive on in! Gorgeous! Ok…yum!! Gosh I love shortbread crusts! These look heavenly and I love that you topped these with a raspberry! So pretty!! It’s like something I’d see at a baby shower! 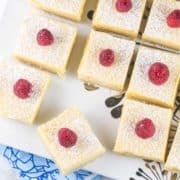 I like lemon bars and these look tart and creamy. 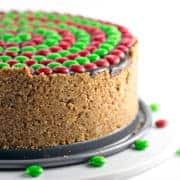 I literally love that you used a shortbread crust instead of a graham cracker crust! This sounds so insanely good – I am absolutely going to make these when we have friends over next weekend! I love any lemon dessert! These Lemon Pie Bars are a fabulous dessert! Love that you made a shortbread crust too! These are easy to prepare so Perfect for a quick dessert! WOW! 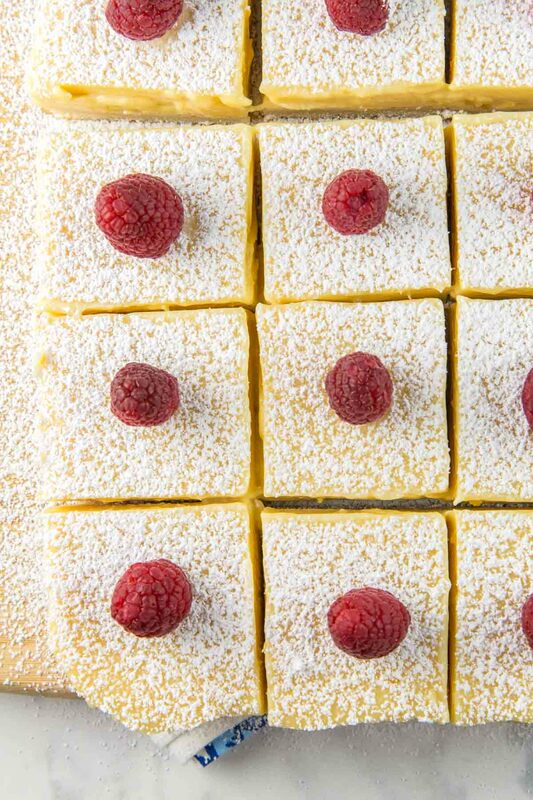 These Lemon Pie Bars look truly over-the-top delicious! Pinning and trying. My grandma has been asking me for my lemon pie bars but I must have misplaced it when I moved. I can’t wait to call her up tomorrow and share this recipe with her! Pinned for later! My husband LOVES all things lemon. He would go crazy for these. I can’t wait to treat him! I love how easy this recipe! I can already taste that lovely tartness and they look so creamy. 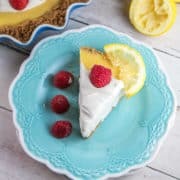 Shortbread crust is perfect and these are perfect for summer! !